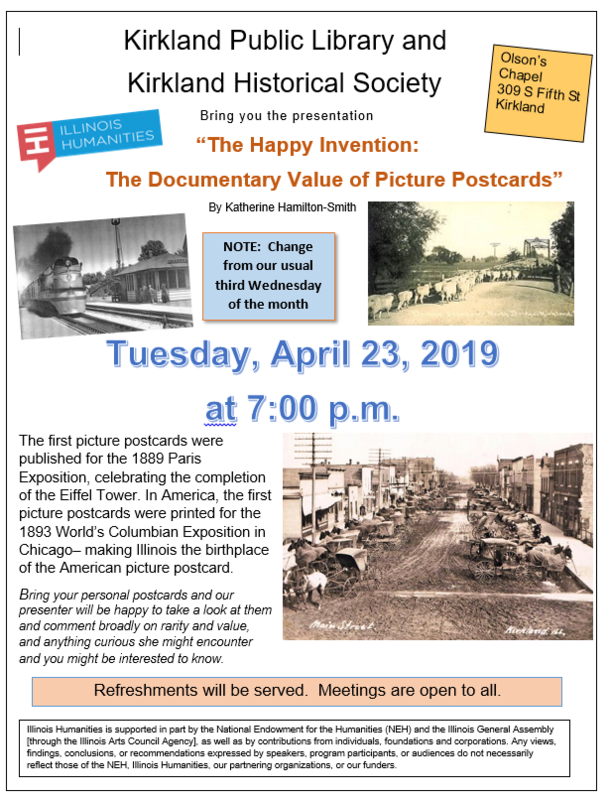 April 9 – Board of Trustees Meeting – 7:00 p.m.
April 18 – Adult Reading Group – 6:30 p.m.
April 20 – Story Time and Easter Egg Hunt with Lions Club – Football Field 12:30 p.m.
Any public, parochial, private or home school student in grades 4-12 is eligible to participate in this contest. Rules and e ntry forms are available at the Kirkland Public Library. Submissions will be accepted May 1-June 17, 2019. Please understand that Rumor is not here to play. Rumor is in training with the goal that she will become a trusted companion of a person who is blind or visually impaired. Join us at the Kirkland Public Library on Wednesday evenings from 5:00 pm until 6:45 pm for an evening of stitchery and fun. If you’re a great crafter, all the better . . . Maybe you have some suggestions for those who struggle. If you’re a beginner, this is the time to learn to enjoy stitching. Whatever you want to do, surely someone will have some experience with the materials and be able to offer suggestions. please feel free to bring your leftovers to share. 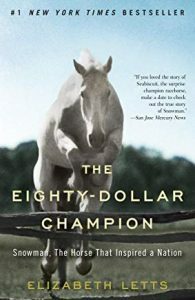 Adult Book Club meets on the third Thursday of the month. All are welcome. If you’d like to join us on April 18th, let me know so I can get you a copy of our selection. Please remember the drop box is to be used only if the library is not open. We only check it first thing when we open and it is not rechecked again until the next time we open. Your book could sit in the box and not be checked in on time. If we are open, please return it inside so that a fine does not accumulate. Also, remember DVDs, audio books, and books borrowed from other libraries may not be put in the drop box — they must all be returned inside and are subject to a fine if deposited in the box. Also, do not leave anything between the doors. We lock our drop box over all holidays as we’ve had trash thrown in and books damaged. Please remember this and return your items either before or after the holiday. Do not leave anything between the doors or you will be responsible for damaged and/or lost items. Looking to honor a friend, remember a loved one or celebrate a special occasion? 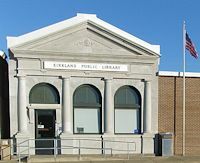 Supporting the Kirkland Public Library through a monetary donation furthers the library’s mission to share the joy of reading, discovery and creativity with the community. Your gift also allows us to honor or memorialize someone special to you. Monetary donations may be dropped off at the library during regular business hours or mailed to us at PO Box 189, Kirkland, IL 60146. The idea is to critique the cookbook, not each other’s cooking. 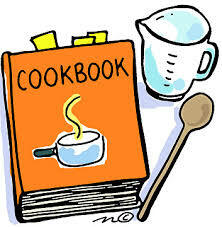 Cookbooks will be borrowed from other libraries so that we will have a variety of books to give our opinion on. Each person will check out a book, make at least one recipe from the book and share their thoughts about the book with the group. If members want to, samples of their chosen recipe may be brought that evening so we can all enjoy. The original Adult Cookbook Club will usually meet on the second Thursday of the month at 6:30 p.m.; however, unlike our other book club, we will only meet every two months. This has been such a popular addition, we are now taking names to start a second group. If you’d like to join in on the fun, please get on the waiting list with one of our librarians. Please remember that family pets are not allowed in the library. 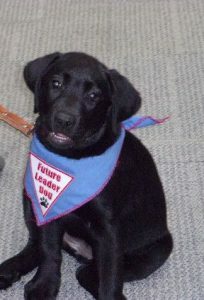 Yes, you’re right – we did have Banjo with us; however, she was being trained to become a leader dog. As with any other public place, a service dog is certainly welcome to be in the library with the person they are assisting. Many thanks to these community members who serve the Kirkland Public Library. 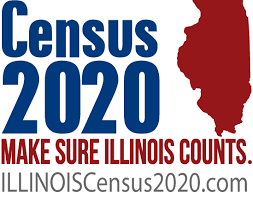 Monday	10 a.m. to 7 p.m.
Tuesday	1 p.m. to 7 p.m.
Wed.	1 p.m. to 7 p.m.